KIEV, Ukraine -- The United States is urging Ukraine to start jailing corrupt officials, after months of political turmoil that has delayed billions of dollars in foreign loans. U.S. Assistant Secretary of State Victoria Nuland speaks during a news conference in Kiev, Ukraine, April 27, 2016. She has called on the country's government "to start locking up people who have ripped off the Ukrainian population for too long." U.S. Assistant Secretary of State for European and Eurasian Affairs Victoria Nuland said in Kiev Wednesday that she was encouraged by Ukraine’s commitment to reforms but stressed that steps must be taken to counter corruption. On elections in eastern Ukraine Regarding elections in eastern Ukraine as stipulated by a peace deal between Kiev and pro-Russia separatists engaged in conflict there, Nuland said that Washington was not setting a specific deadline as was reported Tuesday, but added that the so-called Minsk agreement requires proper preparations for elections, including sufficient security and OSCE access in the Donbass region. 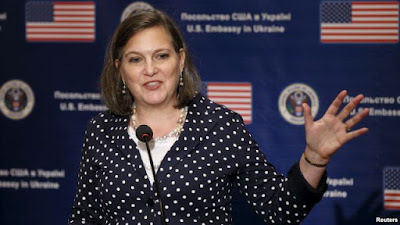 “We have put no date on when elections need to happen,” Nuland said countering an earlier statement by a Ukrainian lawmaker who after meeting Nuland Monday said she was setting a July deadline for the elections. “We have made absolutely clear that Minsk requires that there be sufficient security and OSCE access and the ability of candidates to ballot and the ability of citizens to hear from candidates before you can have an election."